Our nearby neighbors have a new puppy. the little guy in back just joined the family! good manners Ryder won't be far behind. And Whoops- look what we woke up to! Awww, they are both adorable. I would love to have both of them. Animals bring so much joy into our lives. We sure miss our Little Bit. I love your Sparks. Yes, there are many that have less than we do and are quite happy. I'm happy with my life and I know you are too. Cute pup! Both are beautiful dogs. Envy your snow. We were in the eighties this weekend. Puppies are so cute. I think that is going to grow up to be a big dog too. I love your Spark. 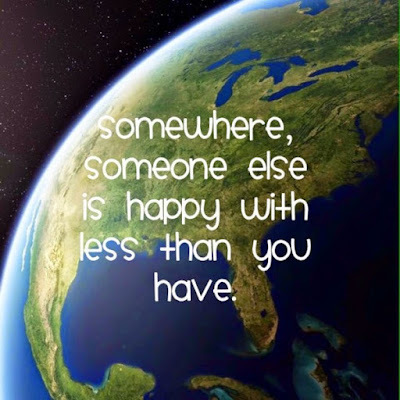 That is so true and something that we should all keep in mind when we are unhappy with what we have. Very cute puppies and an excellent spark, so true. Well-behaved puppers are always appreciated! I hope puppy kindergarten goes well. Love the Spark you chose today. We all need to be grateful for what we have....knowing there are many who have much less. That Spark is so true! Very nice dogs, and we are turning on the A/C while you get snow. Such is life!